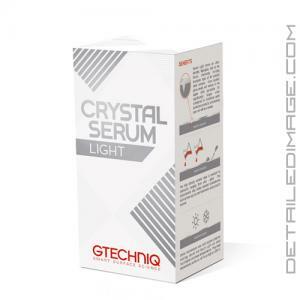 Gtechniq Crystal Serum Light (CSL) is a high quality coatings that will add an unbelievable amount of gloss, depth, and protection. It is so strong that right after you apply it you can't remove it with traditional polishes you would need to wetsand it. CSL was designed from the same DNA as the incredibly popular, but professional only Gtechniq Crystal Serum. The original Crystal Serum professional coating boasts a 7 year guarantee from Gtechniq and they took it upon themselves to make an easier to apply consumer product, which is Crystal Serum Light. While the original Crystal Serum is supposed to last 7 years, CSL will last approximately 3 - 5 years according to Gtechniq. CSL's ultra-durable, high-gloss, slick to the touch, 9h clear ceramic will reach about 80% of the CS Pro's performance (scratch and chemical resistance). When compared to the other consumer Gtechniq coatings (i.e. C1 Crystal Lacquer) it is about double the performance (scratch and chemical resistance). The gloss and shine of the paint is simply put, amazing, and your paint will really stand out above the rest. For the best results we highly recommend removing imperfections before application, like you would with any coating. Once your paint is thoroughly cleaned and prepped with an IPA or Panel Wipe wipe-down, apply CSL in a nice thin layer panel by panel. For in depth application tips check out the steps directly from Gtechniq below. Once applied, CSL will be resistant to chemicals ranging from pH2 - pH12. This means your paint will stay clean and protected from the elements for much longer than before. Pick up the Gtechniq Crystal Serum Light today and experience the amazing look on your car that only a high end coating can supply! My initial impressions of any coating are always based on of a few key points: Price, Ease of use, and Gloss. This coating is competitively priced relative to other consumer coatings, so that is great to see. I was very pleased with the ease of application, and the final appearance of this coating was excellent. Crystal Serum Light is the prosumer version of the world famous Gtechniq Accredited Detailer only Crystal Serum - a coating so hard that if applied incorrectly can only be removed by using 1,500 grit sand paper. Serum Light offers 80% of Professional Serum's performance, but if applied incorrectly can be machine polished from your vehicle's paintwork. When it comes to adding gloss, resisting swirls, contaminant and dirt repellency, Gtechniq Crystal Serum and Serum Light are the pinnacle in paint protection. PERFECT: If required polish your paintwork to remove any imperfections. DE-GREASE: Spray Gtechniq Panel Wipe onto a MFI Microfibre Buff Cloth and then carefully wipe down your paintwork to remove all polish residues. APPLY: Soak the application pad with 2 full measures from the pipette. Spread onto a small panel or 1/2 a large panel and immediately remove residue with a MFI cloth. This is a great product and put a good coating on your car that will last two years, I recommend it to anybody that is looking to put a coating on their car. Or new car. 8 stars. I'm a professional detailer near Chicago, IL. Tried a bunch of coatings until I tried CSL / EXO and never turned back. I've probably coated at least 15 vehicles with GTechniq Crystal Serum Lite or EXO by now and smile every time I use it. Other coatings I've used are finicky when it comes to flash off time, or simply just fight with you on removal no matter what. Not with CSL though! Extremely easy application and wipe off. I've even tried it in direct sunlight once and had no issues at all. Wiped off just as easily! With proper application I can usually get 2.5 - 3 applications out of one bottle. Highly recommend this coating! I've only started using it a year ago so I'm not too sure about durability yet, but given its from GTechniq, I'll take their word for it!